In one of the most unpredictable and exciting editions of the Hell of the North, Niki Terpstra took the title with a bold attack 6km from the finish to cross the line solo. 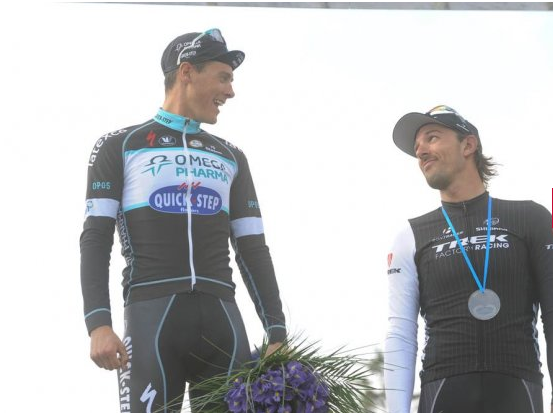 Last week’s Ronde van Vlaanderen showed that, even if OPQS was the strongest team, it didn’t guarantee a podium place. They weren’t about to make the same mistake this week. Tom Boonen, tipped as a contender for a record-breaking fifth title, made one of the key moves of the race by getting in a break with 65km to go. While at the time it looked like Boonen was trying to make a decisive move for himself, it could very well have been a red herring – one that certainly started the selection process that would later benefit one of teammates Terpstra or Zdenek Stybar. After constant whittling of the peloton, an elite group of 11 riders which included Fabian Cancellara, Sep Vanmarcke, Boonen, Peter Sagan and Bradley Wiggins, were making their way to the velodrome when with 6km to go, Terpstra took a flyer off the front. The hesitation in the chasing group as to who was going to go with the Dutchman meant that he quickly had enough seconds in hand to guarantee a solo win in the Roubaix velodrome. Although not considered one of the top favourites for the race, Terpstra has considerable spring classics pedigree, including fifth and third-placed finishes in the Roubaix velodrome in 2012 and 2013 (yes, he was the man who led home the sprint after the Cancellara/Vanmarcke track-stand finish). And this season is already the best of his career to date, winning the overall at the Tour of Qatar, taking his second Dwars door Vlaanderen, finishing runner-up to Sagan at E3 Harelbeke and nabbing a respectable sixth at the Ronde last weekend. So, a surprise win? Yes. But not that surprising. One of the greatest rides of the day has to be Giant-Shimano’s John Degenkolb, who stuck with Cancellara for most of the race and outsprinted him in the velodrome for second place.We also have to mention Sky’s Geraint Thomas, who got in the break with Boonen and put in a lot of work to wear the chasing peloton down. He was a valuable teammate for Wiggins, who stayed with the main contenders (much to my chagrin) and they finished a respectable seventh and ninth. The big loser was Cancellara, who had an unbelievable bit of bad luck halfway through the race when his teammate Hayden Roulston went down in front of him, holding him up and making him use valuable energy to get back to the head of the peloton. Belkin lost out as well, in that they were prominent in much of the major action but could only place Sep Vanmarcke fourth in the end. Their race was typified by Lars Boom, who launched a decent-looking solo attack at one stage and promptly crashed seconds later. The man who did the most to make the final selection was Peter Sagan, who had looked earlier in the race as if he were going to get into the team car but persevered. His attack 34km from the finish separated the men from the boys by forcing Cancellara to give chase, but appeared to ultimately compromise his chances by putting himself in the red. He can be proud of his sixth place, though. 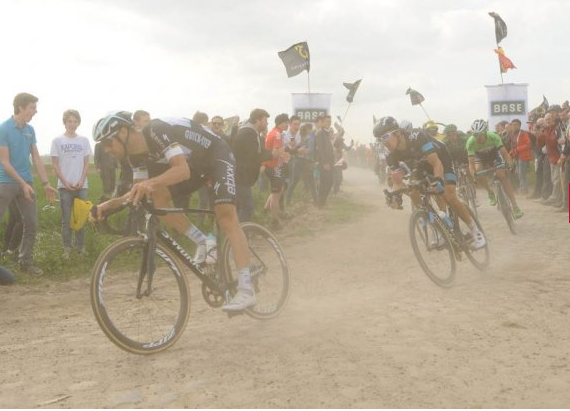 33 – The number of years since a Tour de France winner also won Paris-Roubaix. That was Bernard Hinault in 1981.